Find the Hidden Treasures: A Guide to Mountain Bike Trails in Kananaskis Country by Peter Oprsal is here just in time for spring. The book is written in the style of Peter’s first book Bow Valley Mountain Bike Trail Guide, but is bigger and better in every way, featuring a well thought out layout, colour pics, area maps, ‘How to use this book’ info, and info at the end on the various mountain biking organisations in the Bow Valley area. 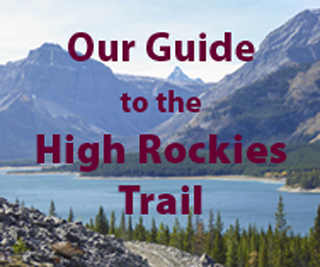 Trails covered are all popular officially sanctioned trails in the areas of Mt. Shark, Kananaskis Village, Quaite Creek, Barrier Lake, Moose Mountain, West Bragg, Sibbald and the Elbow Valley. As a bonus, Peter threw in three popular biking areas in Calgary: Bowmont Park, Fish Creek and Nose Hill. You’ll find many old favorites here including the Jumpingpound Ridge Trail and Elbow Loop. A couple of newer trails, Prospector and Sugar Momma, were omitted because they’re not classified trails. However, they are there for the riding and can be found in Volume 3 and Volume 2 of the KC Trail Guides with maps. Trails descriptions are spot on, giving all the necessary introductory info and the salient points for each trail. Often a long-distance loop is described for each area. As only a sometimes biker, but mostly hiker and scrambler I found it fascinating to compare the biker’s and hiker’s write ups for the same trail. i.e. Razor’s Edge. Lest you think this only a book for hard-core bikers (there is a sprinkling of DHS trails throughout), trails are mostly cross-country and include a good selection of family oriented trails like the paved Bill Milne bike path, the paved path in Bow Valley Provincial Park and beginner trails for each area. Endorsed by Doug Eastcott, author of Backcountry Biking in the Canadian Rockies, who wrote the foreword. Should sell like hotcakes. Purchased the book but was disappointed. Trails covered are very limited and considering it is filled with ads for local businesses, the price is too high.